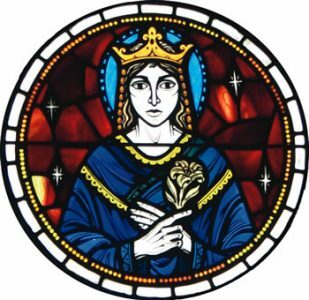 We then celebrate the Queenship of the Blessed Virgin Mary on 22nd August. To my mind, the two feasts are inseparable, because Mary would have been crowned Queen on her arrival in Heaven. 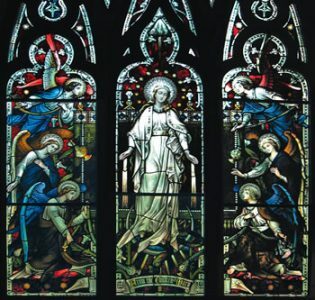 So there are numerous stained glass windows showing a merging of assumption and coronation. Some of these have already been featured in the Messenger (March 2017). Probably the simplest is this one  showing Mary ascending, unadorned other than by the wrap-around decorations. It is in St Pantalèon Church in Chavagnac, Nouvelle-Aquitaine, France. More typical is Mary suspended amongst angels. 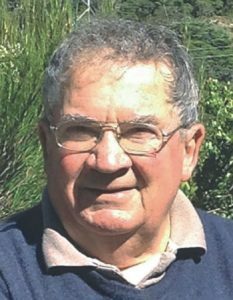 The first  from St Patrick’s Cathedral, Auckland, is spectacular. The other  from St Mary’s Pro-Cathedral, Dublin, on the other hand, is more reminiscent of Revelations, showing Mary standing on the moon with her foot on a snake. One of the most beautiful I have seen is this one  from St Matthew’s, Hastings. Intriguing are three windows in St Mary’s Church, Banff, Canada, which show a progression from dormition to assumption to coronation. The ones showing the Assumption  and Coronation  are shown. 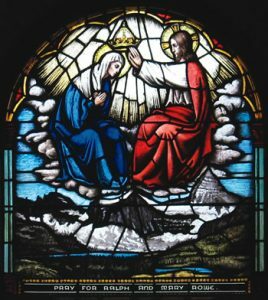 This window  in Holy Rosary Cathedral, Vancouver BC, has a wealth of detail about Mary’s reception as she was assumed. Note the angels incensing, the crescent moon, the snake under her feet. 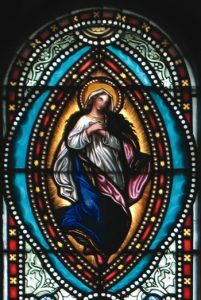 To my mind this window speaks the most about the Assumption - that Mary was taken up body and soul into heavenly glory as befits the Mother of God. 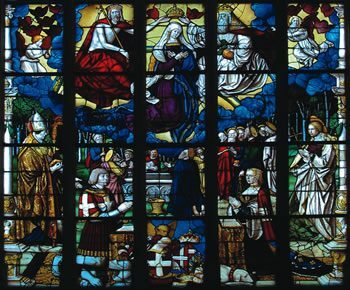 Pope Pius XII said in 1946 “Mary is Queen by grace, by divine relationship, by right of conquest, and by singular choice [of the Father].” This colourful window from Monastere Royal de Brou, Bourg-en-Bresse, France  shows Mary being crowned by God the Father and Son, witnessed by a varied host below, and showing what might be her tomb. 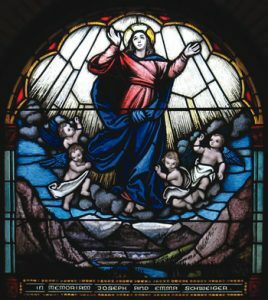 This beautiful window  in St Mark’s Church, Drummoyne, Sydney reflects a simple love of Mary, Queen of Heaven.